Do you ever find yourself making these silent requests of musicians? Well I don't know if Chris DeMakes of Less Than Jake has ESP or not, but he was happy to accommodate with plenty of stage-front action. This shot was made with the Nikon D3 at ISO 6400, which was then pushed 1-stop in Capture NX for an effective speed of ISO 12,800. I used the Nikon 14-24mm at 14mm, with a shutter speed of 1/100 at f/2.8. Opening up the RAW file in NX, I did something one wouldn't normally want to do with a high ISO File, which is to turn noise reduction off. In Photoshop, I used Noise Ninja to apply chroma noise reduction, but no sharpening and no luminance noise reduction. Due to this processing, the image has a bit of grit, but nothing that wouldn't still print nicely. 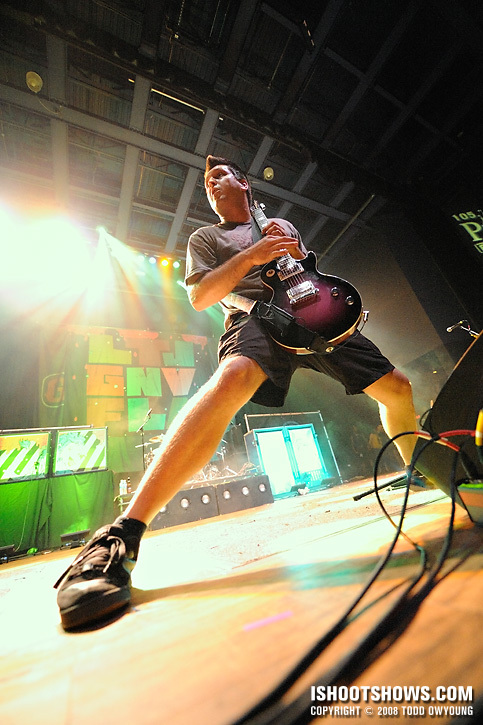 Stay tuned for the full set from Less Than Jake. Next ArticleWarped Tour — Backstage! Regarding technical image quality, the D2x at ISO 12,800 would not have been a pretty sight. I love the angle! You are my favorite photographer! Thanks, Neetu! Glad to hear you like the angle, he’s actually quite close in this shot. And you continue to produce amazing shots! Hoping my employer comes through with a D3 soon.